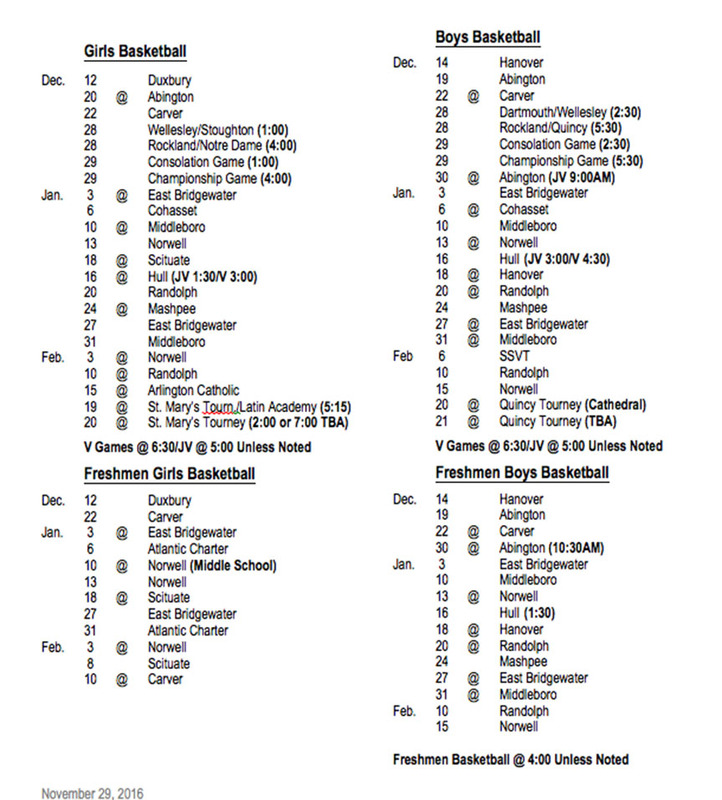 Following is the Winter Athletic Schedule, revised on Nov. 29. Check Graz’ Twitter for any additional changes. 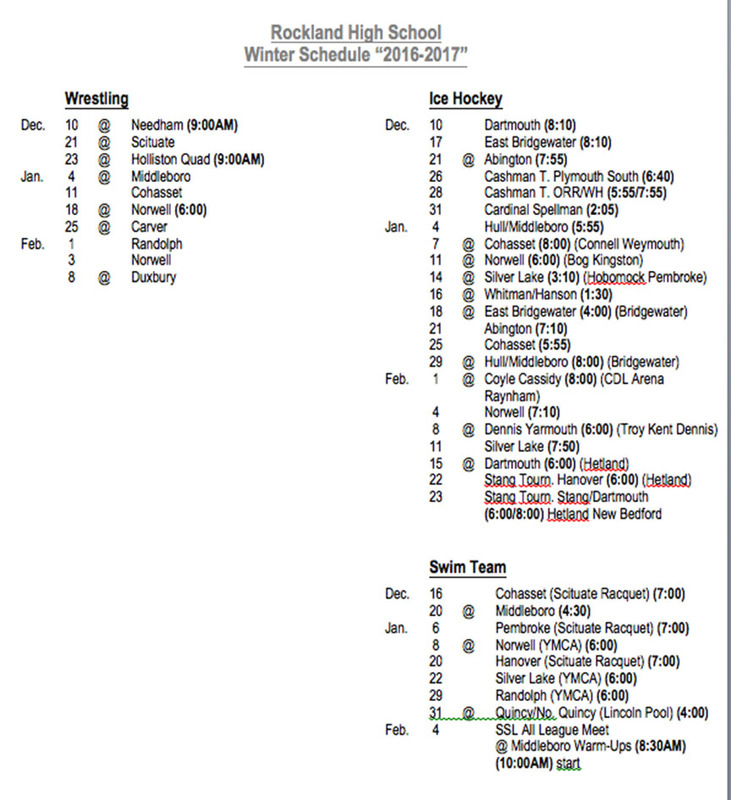 Good luck to all the teams this winter! After you’ve packed up your Thanksgiving leftovers, it’s time to jump into the Winter Holiday spirit. On 11/26 from 4-7 pm, the Saturday after Thanksgiving Rockland is closing off Union Street for their 22nd annual Holiday Stroll. This annual town event hosted by the Rockland Friends Committee is a great time for the town to come together and kick off the holiday season. Citizens are able to walk around and socialize go to different shops, enjoy treats, and drink hot cocoa; there’s even events and activity for the kids to do. Also, the big man himself, Santa Claus makes a star appearance for the children to tell him their wishes and take pictures with. On November 13, Rockland seniors and current members of National Honors Society, Mo Youssef, Lulu Lima, Julia DiCienzio, and Noelle Atkins represented RHS in the WGBH Quiz Show. Rockland was one out of 125 Massachusetts schools that competed for 16 spots on Season 8 of High School Quiz Show on Channel 2 WGBH. The group was accompanied by Mrs. Donovan to Brighton on “Super Sunday.” Once there, the teams had to answer 100 questions in separate rooms in the studio. Although Rockland’s team was not one of the 16 teams that was selected, Mrs. Donovan said it was a lot of fun and they excelled in answering the science and math questions. RHS principal John Harrison said, ” We were well represented by these outstanding seniors.” He hopes that Rockland will compete again next year. 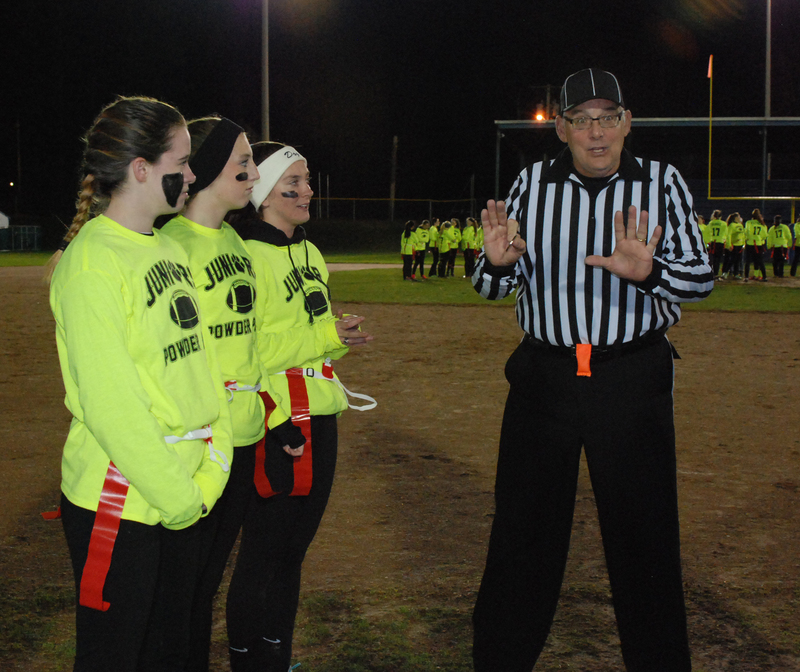 Last night on November 18, the 2016-2017 senior girls played the junior girls in the annual Powder Puff game. In the end, the seniors won with a final score of 12-6. Seniors Maddie Olsen and Mariah Richards both scored a touchdown for their team. The team’s quarterbacks were Maddie Olsen and Erin Buckley. The seniors were coached by John Goode, Matt Dunn, Leo Field, and Mike McPeck. Junior Erika Ochenduszko scored their team’s touchdown. Their quarterback was Sydney McKenna. The junior coaches included Jake Lauria, John Baar, Aiden Glennon, and Jimmy Fitzgerald. All in all, it was a fun, well played game by the girls that viewers and participants alike thoroughly enjoyed. Click on Veritas photographer Maddie Gear’s photos from the game. Matt Dunn sends in subs. At the snack bar: Adam Royle, John Ellard, Francisco Oliveira and Tyler Beatrice. Officials were wrestling coach, Peter Harrison, left, and football coach Damien Ricci. The Class of 2018 came close! Michelle Downey and Jaymie Atkins are serious. Coach Samantha Hoyo looks on. Mike McPeck calls the play. The annual Powder Puff game played between the girls of the junior class versus the senior class is set to start at 6 pm on Thursday at Rockland Memorial Stadium. There is a $5 admission fee. The Class of 2017 came close to beating the seniors in last year’s game, so they will be looking to come out on top this year. Don’t miss this annual Powder Puff battle! Team photo of the Class of 2017 at last year’s Powder Puff Game. The girls soccer team got by Cohasset on Friday, Nov. 11 in the Div. 4 South Semi-finals by a score of 2-1. Rockland (14-4-3) will play South Shore League rival and two-time defending Division 4 South Sectional champion East Bridgewater (19-1-1) in the Sectional Final at 2:30 p.m. at Brockton High School. Sophomore Brooke Jones got the first goal in the first half; freshman Lauren Buker got the second goal in the second half. Junior goalie Jaymie Atkins had several key saves and Bridget Reardon and Emily Beatrice kept Cohasset from advancing on numerous plays. Rockland coaches, Lauren Rizzotti, and Ronnie Ricciarelli along with Cohasset coach, Deb Beal stand for the National Anthem. The girls are ready to take the field for their game against Cohasset at Norwell. Brooke Jones advances the ball right before she gets the Lady Dogs first goal. Veritas photo. Emily Beatrice thwarts an advance by Cohasset’s Sophie Swartwood. Grace Oliver gets ready to pass the ball ahead from the left side in the second half. #14 Madison Blonde has the advantage over a Cohasset defender. #24 freshman Lauren Buker who scored the second goal of the game goes against senior Nikki Federle at midfield. #6 Meaghan McDonough battles against Cohasset. The girls are now going on to the South Sectional Finals on Sunday at noon at Brockton High School.